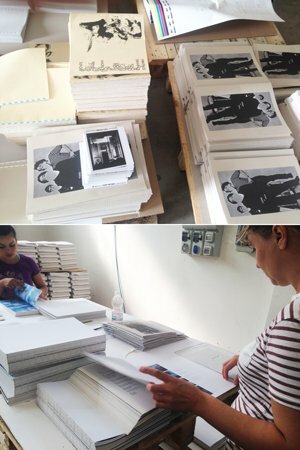 Our binders in Milan are busy creating Deluxe copies of YOKO ONO INFINITE UNIVERSE AT DAWN. In Yoko Ono's intricate edition, nearly 50 pieces are hand-pasted into her book’s 400 pages, including trace papers, booklets, postcards, a jigsaw piece and a wish tag. Our binders are committed to ensuring each copy meets your high standards before being couriered to subscribers across the world. Finished Deluxe books will be shipping next month, November 2014. 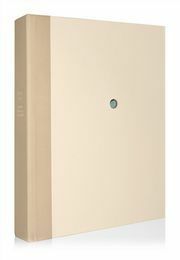 Secure one of only 1,150 numbered Collector copies available to pre-order now from www.YokoBook.com, each signed by Yoko Ono. Pictured left: The team inserting booklets for Yoko Ono’s Galerie Lelong, Indica and AG Gallery shows, and a facsimile of an original Plastic Ono Band postcard.